Opened in August 2005 the Tasmanian Seed Conservation Centre (TSCC) now plays a central role in the conservation work of the Royal Tasmanian Botanical Gardens. Established as part of the international Millennium Seed Bank Project, the TSCC works to stop the loss of plant biodiversity within Tasmania and also conducts studies into the dormancy and germination behaviour of native seed. To learn more about seed conservation, the activities of the TSCC and seed germination please browse through the pages listed in the side menu. Germination data from our testing is available from the TSCC Germination Database. In the following pages we discuss the role of botanic gardens in plant conservation and then look at how seed banking programmes can help in this work. Tasmanian Seed Conservation Centre plays a central role in the conservation work of the RTBG. In the following pages we describe seed centre’s origins, it’s partners and what the seed centre does and why. We also provide a bit more background on the Germination Database. Every viable (living) seed has the potential to become a plant. For this to happen, the seed must germinate. But what is germination? The subject of seed dormancy has been actively researched for at least 100 years, and has been known to exist for far longer. 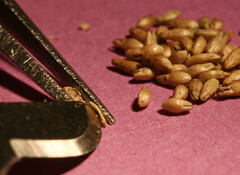 However describing exactly what seed dormancy is can be troublesome.